Krystal you are KILLING it with this Outside Lands series. That floral crown is really working out! Could you please fly over to England and pack for Glastonbury for me next year, please? 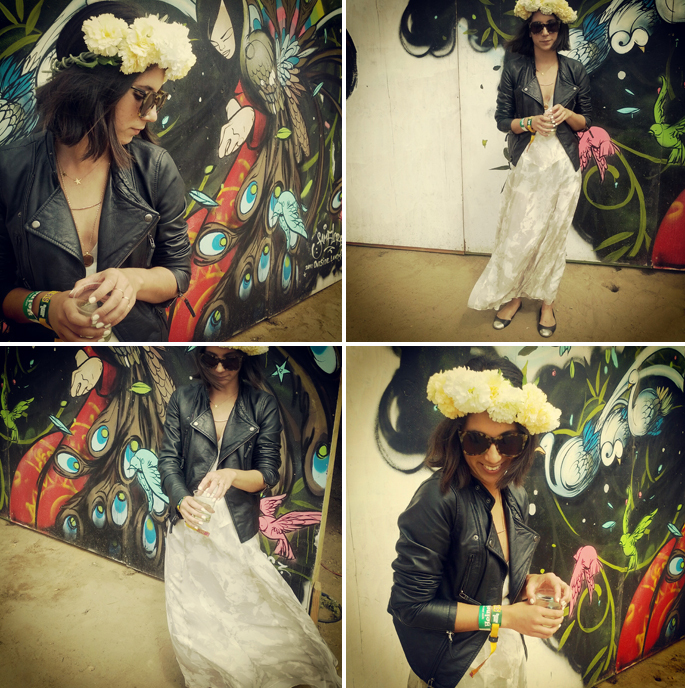 You are nailing the festival style like no other! like your floral crown !!!! LOVING THE SHOES i AM BUYING CAP-TOE FLATS FROM DOLCE VITA RIGHT NOW! Awww, you look so pretty! Gorgeous outfit! Adorable. Another great outfit. Love what you're putting together for this concert series. love the perfecto over the dress! Cute... yes, totally appropriate for San Francisco! You look great as always, but that back drop is insane! What a gorgeous mural! You look so fun- part woodstock, part Sturgis Rally! Your floral crown looks gorgeous! Love your dress too! Love the floral crown! Looks beautiful with the dress! one day i am going to rock a floral crown. i don't care that i am a 37 yo mom. ha ha! love it! You look great in this flower crown. I love this outfit and the crown is awesome! love this whole ensemble! The flower headband with the leather jacket & maxi dress, so cute! Love the mix of the leather with the dress and fun headpiece! I totally appreciate the look but not brave enough to pull it off myself! I am loving your Outside Lands style! This outfit is so lovely. I can't get enough of the leather and Karen Walker sunnies. such an awesome look, i love a good flower crown! gorgeous pictures Krystal ! just love them ! love your crown! they're fun accessories!